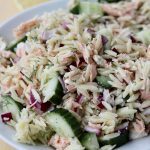 This salmon orzo salad is affordable,tasty, minimal ingredients and way healthier than anything you will get over the deli counter! You are winning on all accounts here. Have you guys checked out my recent post of Avocado Summer Lasagna? It’s basically all the flavors of summer combined in lasagna form. Anyways back to this Salmon Orzo Salad. My go-to place for salmon filets is Costco. I’ve found that their quality is decent and you get the most bang for your buck. I buy about 2-3 pounds at a time and freeze whatever I don’t use. Easy and affordable. As far as I’m concerned one of the greatest trifectas in the culinary world is salmon, dill and lemon. They balance each other out so well; the fattiness of the salmon, bright acidic juice of the lemons and warm and mild flavor from the dill perfectly compliment each other. 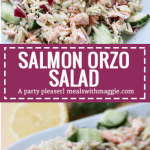 Plus, did I mention this salmon orzo salad recipe makes A TON of food?! When I originally measured it was about 10 cups. However, that was after Sean and I had already been eating it so I assume there might be closer to 11-12cups. PERFECT FOR BIG GROUPS. i.e dinner parties, potlucks or Sunday meal prep! 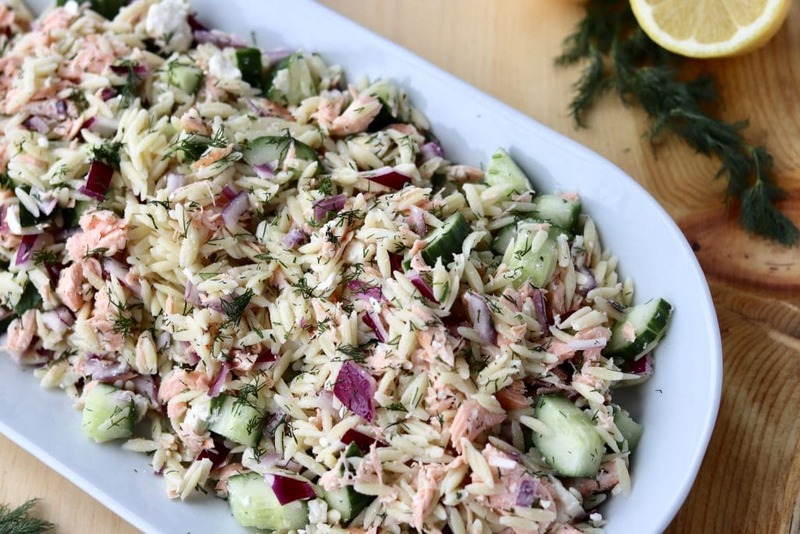 The perfect Salmon Orzo Salad with lemon and fresh dill is the perfect dish to bring to your next dinner party or potluck! Preheat oven to 450. Place salmon on baking sheet and bake for 12-15 minutes until internal temperature reads 145 degree F.
While salmon is cooking, cook orzo according to package instructions ( usually takes ~9 minutes). 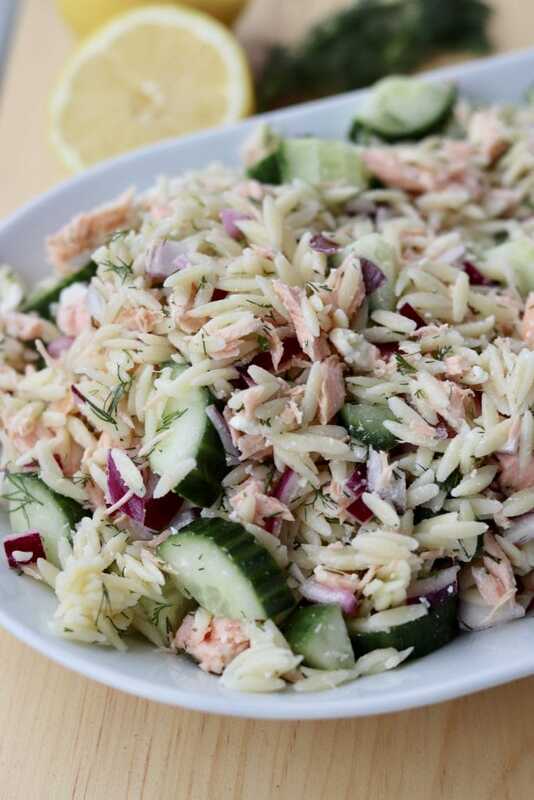 Once orzo and salmon are done cooking, allow to cool before assembly of the salad. 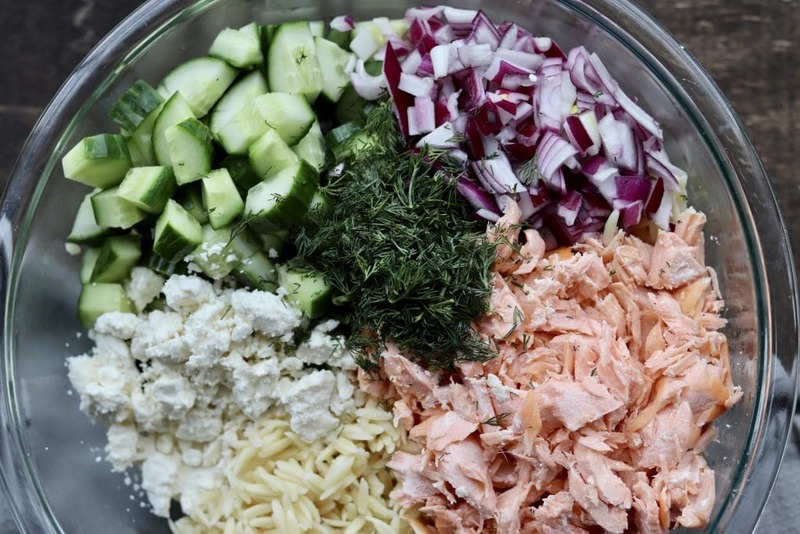 Crumble salmon into small pieces and combine with the orzo, red onion, feta and dill. Stir to combine. In a small bowl combine olive oil, black pepper and lemon juice. Toss salad in dressing and refrigerate until serving. This salad stores in the refrigerator for up to 5 days. You can use dried dill instead of fresh if that’s all you have, but I prefer fresh. Looks delicious! 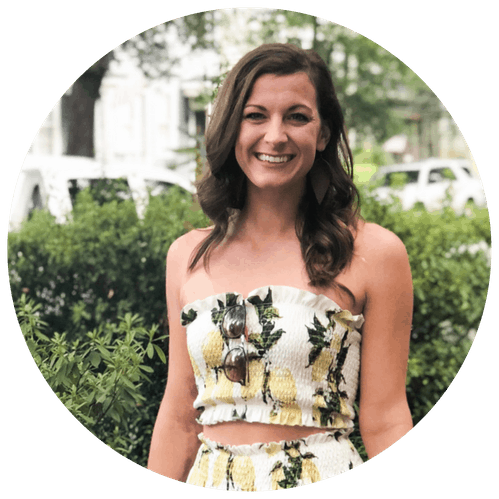 How much orzo are you using for these proportions? I used 8oz of Orzo! Just made this tonight so yummy! Thanks for the idea! My 2 and 4 year olds loved it also! Thank you Kathleen! Glad you and your family enjoyed it!